Slothful. What a great word. It’s such a mouthful, and sort of swirls around in there, the air and your tongue and teeth falling all over each other. Sunday mornings are made for being slothful, getting all tangled in your sheets because you just can’t seem to make the giant move out of your bed. Kids when sick are inherently slothful. Unless, of course, they are hurling. Which is a lovely word choice when you don’t want to say vomit. This of course was a joke in more than one way. He returned close to an hour later with his treasure behind his back. We got to see just how slothful a sloth is, when our guide returned him/her to a lower mangrove branch. For an animal who comes down out of a tree only once every seven days to poop, I would have expected the flee impulse to be quite strong after what must have been a kind of harrowing half-hour. 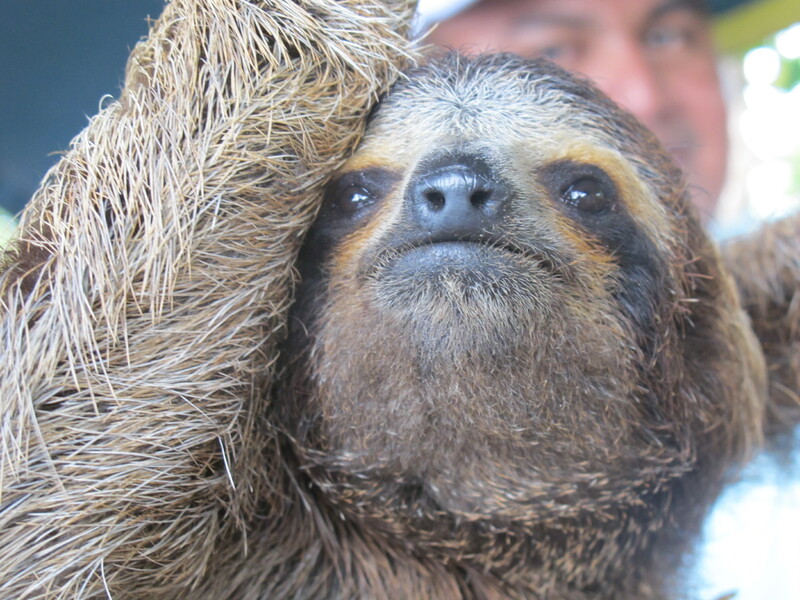 But true to sloth-y form, he/she moved in slow-motion, one 3-toed foot/arm at a time. In no hurry whatsoever.